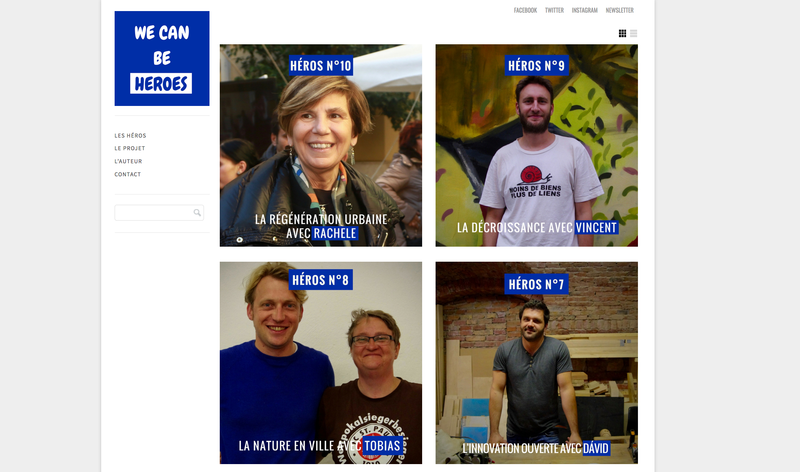 Tour d'Europe avec "We Can be heroes"
Inspired by the film "Tomorrow" by Cyril Dion and Mélanie Laurent, Thomas Tichadou has embarked on a project of meetings across several cities in Europe to discover citizens leading new models in the heart of their neighborhood and their community. He has just returned from a five-month trip (July-November 2017) to Europe and beyond: 15,500 km from Kiev to the East to Tunis to the South, during which he met fourteen actors of the transition and with which he exchanged on their concept, functioning, economic model, but also on their approach to life and their commitment. Since his return, he has launched the project We Can Be Heroes whose goal is to share his discoveries and inspirations with the greatest number. Sharing the same DNA, we decided to collaborate with Thomas who enriches the database of New CITYzens initiatives spotted across Europe and whose work we share as widely as possible with our other members! Before considering why not other joint projects! To see the discoveries of We Can Be Heroes, visit his profile: http://www.newcityzens.com/en/member/163/we-can-be-heroes and his website.